Keith Long’s Bohemians were given a rude midweek awakening at Dalymount Park on Tuesday, as Champions Dundalk flitted back up the M1 with all three points following a particularly ruthless performance. Goals from David McMillan, Jake Kelly, and Darren Meenan put Dundalk top of the table, but the game was far closer than what it looks like with a glance at the result. Despite the misleading scoreline, the home side put in a spirited, determined performance, and could easily have been ahead by the time Anto Murphy was sent off early in the second half. Even after Murphy’s harsh dismissal for two yellow cards, the Gypsies really took the game to the Lilywhites, and were unlucky not to be on level terms by the time the visitors pulled away with two late, ill-deserved goals, writes KEVIN FAGAN. After three games with the same starting eleven, boss Long made just one change to the starting line-up for the visit of Stephen Kenny’s men. Robbie Creevy replaced Kealan Dillon in central midfield, as Bohs embarked on their second of three games in a six-day period. Perhaps surprisingly, Bohs actually dominated possession in the opening quarter, but struggled to create chances from open play. The ball was being presented back to Dundalk at regular intervals, which is always dangerous with their counter-attacking potential. The first big incident of note was a penalty shout in the 11th minute. Adam Evans’ cross bounced up off Brian Gartland’s thigh onto his left arm. Gartland’s arm was away from his body, and the ball clearly struck it. 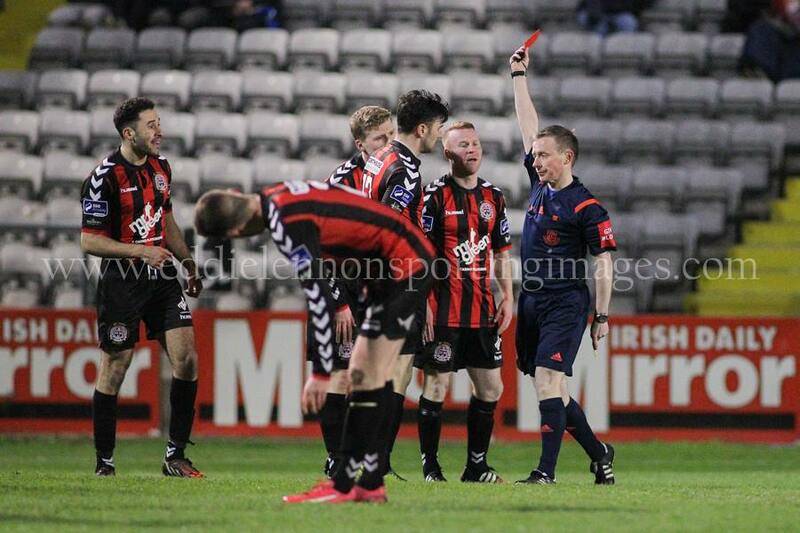 However, referee Derek Tomney was in no mood to point to the spot, and this was the first of many decisions from the man in black that irked the Bohs fans and bench alike. Bohs’ best opportunities in the first half came from set pieces. Lorcan Fitzgerald’s deliveries were absolutely perfect on more than one occasion, and Dundalk had a huge amount of luck in keeping a clean sheet. First, Anto Murphy rattled the bar from an inswinging corner. The ball looped into the air, and was almost turned in acrobatically by Derek Prendergast, but his effort trundled wide. Fitzgerald was again the provider of Bohs’ next best chance. This time, his wickedly whipped free kick took a slight deflection off a Dundalk head before evading Prendergast and Dean Kelly by inches. A touch from either would have opened the scoring. With clean sheets in all 5 competitive games so far, it was going to take either a moment of brilliance or a scruffy, unlucky goal to breach the Bohs defence. Sadly, it was the latter. After a corner was cleared, Daryl Horgan played head tennis with the Bohs defence, and his second looped header found David McMillan at the back post. McMillan headed it tamely toward goal, but the ball took two deflections and dribbled over the line. Dundalk headed for half time with a fortunate 1-0 lead. The Champions were lacklustre, and probably couldn’t believe their luck when referee Tomney intervened to spoil what was turning into an intriguing contest. Anto Murphy had been deservedly booked in the first half for a clumsy lunge at Darren Meenan, but his second yellow was as soft as they come. On the edge of the Bohs box, Murphy’s sliding challenge on John Mountney was executed perfectly. He took ball first, then man. It was a strong challenge, but Mountney’s theatrical fall and scream may well have been the deciding factor. His initial writhing stopped when it became clear that Murphy was about to get a second yellow, but the damage was done. Rather than capitulate being a man and a goal down, Bohs actually increased their pressing and pressure after Murphy’s dismissal. It was a stirring second half performance, with full-blooded commitment from back to front. Long sent on Marc Griffin and Jason Byrne to try and salvage a point, and they almost fashioned an equaliser with 15 minutes left. The tireless Derek Pender whipped in a delightful cross that fell onto Griffin’s toe 8 yards out, but the former Dundalk man couldn’t generate any power, and Gary Rogers was able to paw it clear. With Bohs committing men forward, a counter-attack sucker punch was always possible, and Dundalk ruthlessly closed out the game in the last few minutes. First, in the 83rd minute, the excellent Horgan sped down the right, and put Richie Towell through. Towell unselfishly squared to substitute Jake Kelly, who side-footed in the second. Then, with 4 minutes remaining, Darren Meenan grabbed the third with a low shot that had too much power for Dean Delany. 0-3 is a scoreline that greatly flatters Dundalk, but the reaction of the Bohs fans at the end of the game said it all. The team were roundly applauded off the field, with a faint chant of ‘Bring on the Rovers’ in their ears. There is no better game to bounce back from a defeat than a trip to Tallaght. Friday night is already close. Bohemians: Dean Delany, Derek Pender, Derek Prendergast, Anto Murphy, Lorcan Fitzgerald, Paddy Kavanagh (Kealan Dillon), Roberto Lopes, Robbie Creevy, Adam Evans, Keith Buckley (Marc Griffin) Dean Kelly (Jason Byrne). Subs not used: Lee Steacy, Karl Moore, Jake Hyland, Dylan Hayes. Dundalk: Gary Rodgers, Sean Gannon, Brian Gartland, Andy Boyle, Dane Massey, Chris Shields, John Mountney (Darren Meenan, 63), Richie Towell, Ronan Finn (Kurtis Byrne, 76), Daryl Horgan, David McMillan (Jake Kelly, 80). Subs not used: Gabriel Sava, Ciaran O’Connor, Shane Grimes, Paddy Barrett.